No festive decorating scheme is complete without a Christmas garland. Whether you're looking for a discreet and minimalist design to wrap around a bookshelf, or are going all out and covering every visible surface with Christmas garlands, we have a range of options, from realistic foliage to abstract designs. What will take your fancy? Looking for more? We've got 21 ideas Christmas decorating ideas that you will want to copy. Perfect either in lieu of or in addition to a Christmas tree, the Two Whitewashed Glass garlands from Cox & Cox have an attractive distressed glazing that will look great as part of a vintage Christmas decorating scheme. Whether as part of a traditional Christmas look or a more contemporary Scandi Christmas decorating scheme, a green Christmas garland that experiments with eucalyptus, juniper, or even oak branches, instead of the traditional pine or fir, is a lovely pick. The Eucalyptus Wreath & Garland from Lights4fun come in a handy bundle, and look very delicate and convincing. Pining for some bright colour in the middle of winter? Go for a kitsch decorating scheme and forget about having to tastefully match your decorations. We love the explosion of colour provided by the Multi Coloured Pompom Garland, the Rainbow egg hanger, and the Glass Strawberry Bauble, all from John Lewis. We have loads more kitsch Christmas tree decorations, too. If you're going for a traditional Christmas decorating scheme this year, then fir branches are a must. We love the very realistic-looking Festive Foliage Runner from Ginger Ray. Feeling the itch for something a bit different this year? Liven up your traditional Christmas garlands and wreaths with fresh or artificial flowers. Red roses look particularly stunning when you mix them with frosted cones. Don't have time to make your own? The Snowy Fir & Cone Garland with Red & White Flowers by Gisela Graham is available from Duckbarn Interiors. For an understated, go-with-anything look, go for a frosted leaf garland, which will look especially lovely against wooden furniture. Our pick is the Sage & Berry Garland from Cox & Cox. Silver bells, silver bells... get a slightly more interesting version, with built-in LED lights. The Silver Bell Battery Lights by Gisela Graham are available from The Contemporary Home. Nothing beats good old tinsel for creating snowy Christmas drama in your living room. The Silver Tinsel Garland from Next is so versatile: hang it up along your staircase, drape it over your mantlepiece, or around the bottom of your tree. You've finished decorating the living room – now what about the kitchen/dining room? Complement the warmth of a rustic kitchen with a warm gold Christmas garland. Our favourite is the Gold Leaf Garland from The National Trust. Want to keep to a cool, Scandi Christmas decorating scheme this festive season? 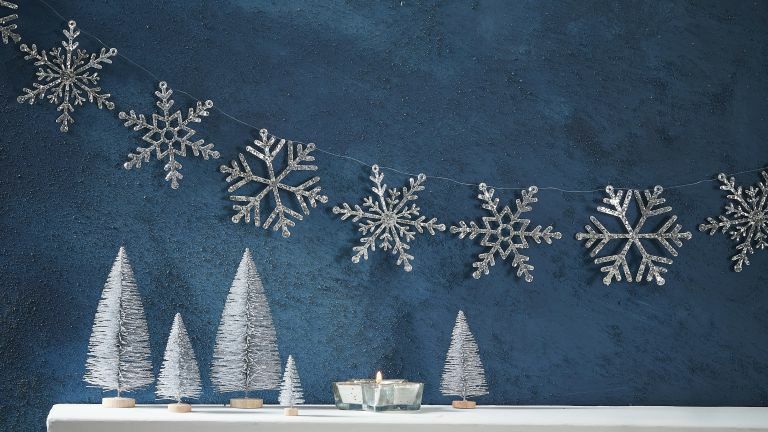 All you need is a string of snowflakes! The trick is to keep it simple. We love this Nordic decorating scheme, finished with the Silver Glitter Slowflake Garland by Ginger Ray. Want a garland that will instantly cheer up the room? Always go for warm, yellowy lights rather than cool frosty ones. Go for several different garlands, too, mixing tiny lights with larger ones. We love the very warm-coloured Jewelled Twig Light Up Garland from Cox & Cox. For an easy and classic Christmas charm that will also effortlessly translate into New Year's Eve celebrations, pick a metallic garland. Our favourite is the Gold Circle Garland Ginger Ray. What could be more cosy than a traditional patterned Christmas jumper? The Red and White Festive Jumper Wooden Bunting from Ginger Ray is also a clever little nod to the Scandi decorating trend. Alternative and handmade materials are big in Christmas decorating this year, and this applies to Christmas garlands, too. So, forget tinsel and try something made from felt instead. We like the Christmas Tree Star Ornaments by Littlenestbox, available at Not On The High Street. To add festive drama to a neutrally painted room, choose dark green foliage with distinctly shaped leaves. Eucalyptus is always a good choice, or a combination of different herbs and fir. What you want is plenty of interestingly shaped, spiky branches that will frame your mantelpiece or window. This Christmas decorating scheme has been created using the 1.8m Eucalyptus Christmas Garland from Lights4fun. We can't stop looking at this delicious Red Berry Garland from Cox & Cox: the berries are so shiny and pretty, it's almost good enough to go on the tree on its own, instead of baubles. Of course, it will also make the perfect accompaniment to a traditional, red-green-and-gold decorating scheme.